Every two years, the Donate Life Transplant Games of America hosts a multi-sport event to celebrate of the lifesaving power of organ, eye and tissue donation. Competition events are open to living donors, organ transplant recipients, bone marrow, corneal and tissue transplant recipients. This June 10-15, the Team Texas Life Warriors will make their way to Cleveland, Ohio to compete and participate in a variety of exciting and meaningful events honoring donors and the second chance at life their precious gifts have made possible. 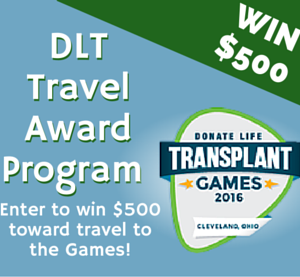 Donate Life Texas is proud to support the members of Team Texas and hosted the DLT Texas TGA Travel Awards Program offering the chance for team members to win one of ten $500 awards. Team Texas members entered the program by sharing their Donate Life Stories. Since these stories were posted on the Donate Life Texas website, they gave visitors a way to meet the TGA participants and be inspired by their personal experiences, learn the many ways they help promote donor registration in our communities and find out what participating in the Transplant Games means to them. Our special thanks go out to the 24 Team Texas participants who submitted their Donate Life Stories as part of this program. We invite you to visit the Share Your Donate Life Story page to see them all, and even to submit your own story of how donation and transplant have touched your life. And now….drum roll, please……Donate Life Texas is proud to announce this year’s WINNERS of TGA Travel Award Program! Next Next post: ¡Viva Fiesta, Viva La Vida!